Riots in London, fear in France and Italy, meltdown in Greece and downgrades in Washington. Occupy movements in every major city. These are worrying times for anyone with half a brain and terrifying for anyone with a whole one. Give or take the occasional riot, we in Britain have tended to think we’re relatively safe from these storms. Yes, the government managed to get into serious debt, but we’re starting to work our way out. The ratings agencies view George Osborne as Mr. Credible. And, hey, at least we’re not in the Euro. But the British economy is stalling badly and our financial system is much weaker than the authorities would have you believe. Worse still, the biggest threat to our financial system is one that most likely affects you personally. 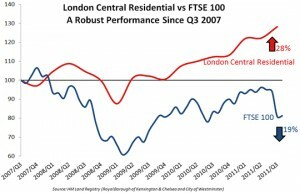 British property prices are far too high and set for a fall. Transaction volumes are still unbelievably sluggish, mortgage approvals still in a slump – but the problem isn’t volumes, it’s prices. There are two main ways of measuring whether property is fairly valued or not. 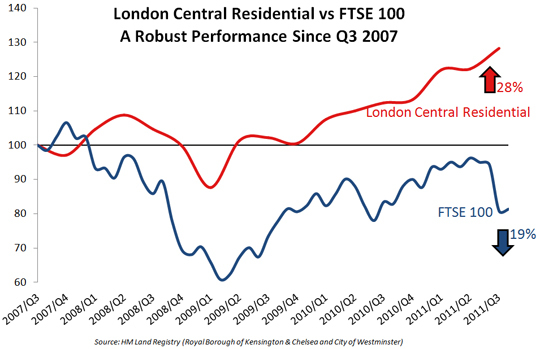 The first is to compare house prices with average earnings. The second compares house prices with average rents. On both measures, the UK market looks screamingly overvalued. British house prices are around 50 per cent too high in relation to incomes and about the same amount in relation to rents. That’s not all of it. Housing markets are volatile. That means they overinflate in a bubble, but they crash too far in a slump. If prices are 50 per cent above their fair value, a collapse of more than 60 per cent is well within the realms of possibility. Crazy? Think about where on earth the housebuyers of tomorrow going to come from. A recent report quoted some young people as saying they ‘don’t think they will ever be able to afford to buy a property. ’ At these prices – they’re right. That’s why the average age of a first-time buyer has been soaring and why the ‘Bank of Mum and Dad’ remains essential to so many new buyers today. Then think about what’s happening to interest rates. The Bank of England has been in existence for more than 300 years and it has never once operated a monetary policy which is as slack as the one that has now been in place since 2008. Prices in parts of the UK have already fallen more than 15 per cent from their peak despite a Bank of England rate of just 0.5 per cent. London prices are frightening – frothy and bubblicious. When interest rates return to sane levels, as they’ll have to if the Bank is to cope with runaway inflation, people are suddenly going to start finding that their mortgage burden becomes rapidly insupportable. All this at a time of high inflation, high fuel prices, high food costs. You only have to look at the US to realise what happens when you get a cycle of mortgage defaults, repossessions and distress sales. In America, prices have already fallen at least 30 per cent and they’re still headed down with no bottom in sight. No? You still don’t believe me? Then look at it this way. Can you name any occasion in history when a developed country simultaneously faces savage government cuts, swingeing rates of tax, high inflation, rising unemployment, depressed growth abroad, rising interest rates, huge levels of debt, and doesn’t have a housing crisis? In the UK housing slump of the early 1990s, the world situation wasn’t nearly so bleak as it is now, yet prices (in real terms) still fell by well over a third from peak to trough. These thoughts aren’t comfortable ones. Not for me, not for you, still less for George Osborne and his colleagues. But you don’t avoid disaster by wishing it away. Great insights! Relieved I’m on the same side as you.